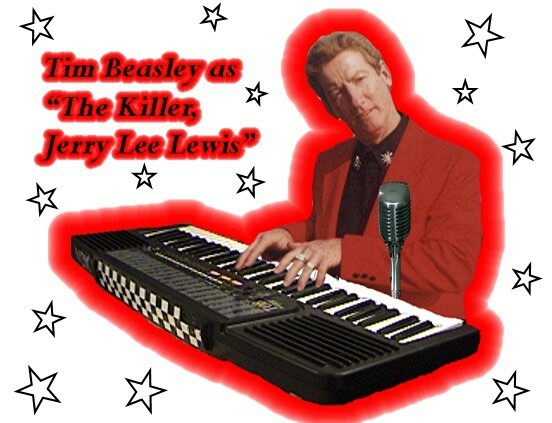 Tim Beasley is a natural look alike to Jerry Lee Lewis, the original rock n’ roll wild man. 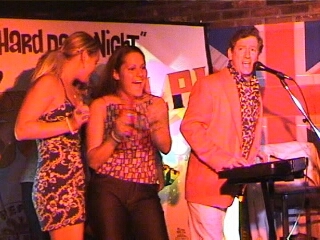 Tim’s Jerry Lee Lewis impersonation show and tribute performance is as hot as it gets for a "Great Balls of Fire" kind of reaction from every audience! 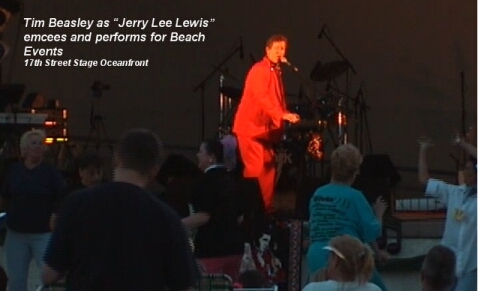 Jerry Lee Lewis is a very important figure in the history of rock n’ roll, and Tim performs all those tunes like "Whole Lotta Shakin’ Goin’ On", "Breathless", "Great Balls of Fire" and the latter "Country" hits that made "The Killer" a legend in his own time. With his natural dark wavy auburn hair, lanky limbs, rooster style struttin,’ keyboard hammering and soulful vocals, Tim will have the crowds "Shakin" for more! Tim can spotlight perform his Jerry Lee Lewis solo tribute or combine his multi-impersonation talents into a one-man spectacular also featuring his Elvis and Roy Orbison tributes for a night of Memphis memories! For the "record," all three where recording artists at the famous Memphis Sun Records.